True to Scale Highly Detailed Small Logo of the third generation 1958 Chevrolet ‘Biscayne’ vehicle with it’s headlights on, finished off with the ‘Chevrolet’ Bow emblem lit up like a neon light. The artwork is of a group of Chevy cars in the parking lot of an evening at an old ‘American style’ Diner from the ’50’s. Firstly in the forefront, we have the classic Blue 1958 Chevrolet Bel-Air Impala Hardtop Sport Coupe, customised with side ‘lake pipes’, lowered suspension and custom paint. Following closely behind is this beautiful example 1949 Chevrolet “fastback” with it’s custom ‘ole skool flame’ paint work over the Black, custom chromed ‘billet style’ wheels, and what could only look like the ‘tuck and roll’ interior, through it’s glass. Gracing the car park of this Diner, is the unforgettable Chevrolet shape being the 1957 two door Bel-Air Sort Coupe, beautifully presented in two tone colour of White roof, and ‘Banana Yellow’ body work, with White wall tyres and colour coded Chevy Rallye Rims to finish of the package. Finishing of the ‘cruising’ group, is what can be seen as a very nice fourth generation Red 1959 Chevrolet Impala convertible, parked next to the second generation 1955 Chevrolet Nomad in a custom Blue hue. 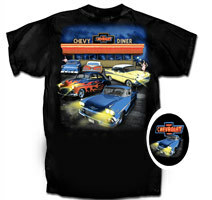 The background of the Tee accents the typical 1950’s Diner, proudly displaying the bright neon lights with the large ‘Chevrolet Bow Tie’ emblem up top of the Diner roof. Also can be seen are two of the vehicles (55’ Nomad & 57’ Bel-Air respectively) being served by the waiter staff dressed in period uniform of that era.